Orange County Mayor Teresa Jacobs joined regional leaders to celebrate Emirates Airlines’ newest gateway to the United States. : Orlando International Airport. The Dubai-based airline began its daily nonstop passenger service from Orlando to Dubai this week. Not only is the new passenger service the first of its kind in Orlando, it is also the first time an Airbus A380 aircraft has ever landed in Orlando. Orlando is Emirates’ 10th U.S. destination. This new passenger service, and its global gateway to the Middle East and Asia, is expected to impact Central Florida’s economy significantly. “The benefits of this new service will be measured not only financially with a $100 million economic impact annually to the region, but also for decades to come as our business community takes advantage of efficient access to new destinations on several continents,” said Frank Kruppenbacher, Chairman of the Greater Orlando Aviation Authority (GOAA). 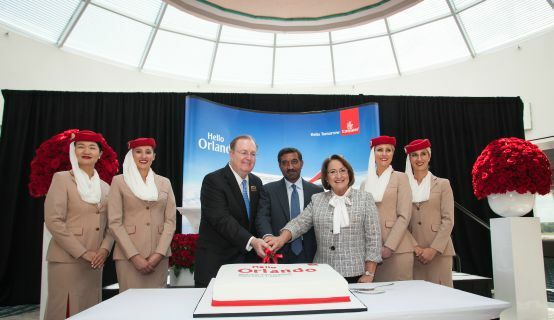 Emirates is the newest international airline to launch service to Orlando International Airport. The airline will add to the airport’s growing international traffic, which increased 9.6 percent in 2014, representing 12 percent of the airport’s total traffic activity. Last year, Orlando welcomed more than 1,000 new international passengers every day and Emirates’ will further boost that number. “With Emirates’ new daily service to Dubai and other popular destinations throughout Asia and Africa, we will be able to extend our world-famous brand to even more potential visitors and guests, as well as corporate leaders and executives,” said Orange County Mayor Teresa Jacobs. The launch of Emirates’ passenger service through Orlando International Airport is perfectly timed, as the state is investing $145 million in the world-class airport for an expansion of the South Terminal Complex, which will boost domestic and international passenger service. Emirates’ inaugural flight to Orlando flew a VIP delegation, a contingent of international media and passengers from 29 different countries to Orlando. Journalists embarked on a familiarization tour upon arriving in Orlando, which was hosted at the University of Central Florida’s (UCF) College of Medicine in Lake Nona. The agenda included an overview of Orlando’s economy and regional developments as well as tours of UCF’s College of Medicine and the Sanford Burnham Prebys Medical Discovery Institute. Photos of the Inaugural Celebration and Familiarization Tour are available on Flickr for use by the media.